The TRUE RMS Industrial Multimeter Benning MM 7-1 captivates by its simplicity. The industrial multimeter is able to present all basic measurements on the display. Besides measurement of voltage, current, resistance, capacity etc. the TRUE RMS Industrial Multimeter Benning MM 7-1 is able to perform low z measurement. The industrial multimeter avoids capacitive or inductive currents. The measurement category of the industrial multimeter is performed in CAT IV 600 V. An included sensor on the head of the TRUE RMS Industrial Multimeter Benning MM 7-1 enables a contact-free current detection. Besides showing the measurement value the display of the TRUE RMS Industrial Multimeter Benning MM 7-1 has a bar graph for classification of measurement results into the measurement area of the industrial multimeter. Owing to this fact this industrial multimeter is the best one among all multimeters. Due to the background lightning the display is easily readable in every situation. 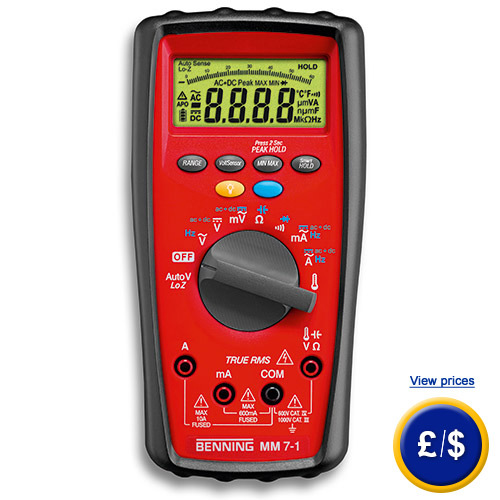 If there are any questions about this TRUE RMS Industrial Multimeter Benning MM 7-1 have a look at the technical specification below or call: UK customers +44(0) 23 809 870 30 / US customers +1-410-387-7703. Our technicians and engineers will gladly advise you in all multimeters and all products in the field of measuring instruments, regulation and control and scales.